Recently I’ve been experimenting with many different types of strings to find the right combination for my Ramirez 2CWE nylon string electric cutaway guitar. As a jazz player my technique on the nylon strings tends to produce squeaks on the wound basses. Since discovering that Savarez offers semi-polished basses & D’Addario carries a recording set, I’ve spent several months working with different combinations & here’s what I’ve found. 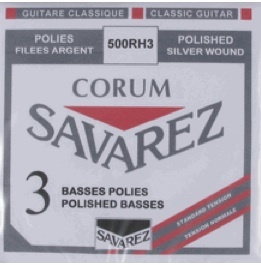 Savarez Basses: Available in Sets of (3). Pros: They feel & sound good. They are only offered in normal tension so if you tend to “dig in” a bit & play more aggressively buzzing results. Pricing: $35.00 for 3 strings, Ouch! Durability: They wear out quickly. The basses start to fray in about half the time of a normal Savarez set. Changing nylon strings is an ordeal for me. It takes at least a week for the strings to settle in so I only get 3 weeks of quality playing time per Savarez set before they start to unravel. I first learned about these strings from George Santos at D’Addario. I’ve been using D’Addario Chromes on my L-5 for some time with great results & George asked if I would try these out. I’m so glad that I did! Pros: They sound good but a bit brighter than the Savarez. I prefer a warmer tone; a little EQ adjustment did the trick. Pricing: About $18.00 for a full set. Durability: I gig with my Ramirez several times a week in all sorts of environments. I put the EJ51 set on in March & am beginning to feel guilty that I haven’t changed them yet. Tension: Hard tension, a real plus for me. Enter San Diego Luthier Len Laviolette. (Check out some earlier posts to see examples of Len’s great instruments) Lately, Len has been installing the Savarez Alliance 541J, 542J, & 543J Carbon trebles on all of his custom built instruments. He uses the traditional D’Addario basses exclusively. Len mentioned that the folks at D’Addario are also developing Carbon trebles that should be available soon. When I installed the Carbon Trebles it transformed the feel of my Ramirez. I tried to look up the actual tension of the Savarez trebles on their website but it doesn’t appear to be listed. I’m guessing that it’s slightly higher than the stock D’Addario trebles. I’ve always been challenged by a certain amount of looseness / buzzing with the Ramirez but it’s dialed in now. The carbon strings are a bit warmer in tone & smaller in diameter as well. I’m extremely pleased with the hybrid set. 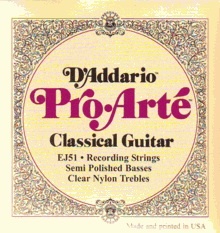 In conclusion, try out the D’Addario Pro-Arte’ EJ51 Recording Strings. I’m sure you’ll be pleased. 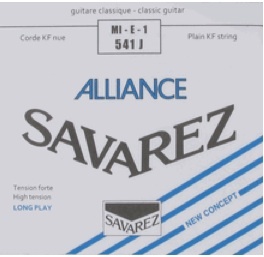 If pricing isn’t important & you don’t mind the hassle of changing strings frequently try the Savarez as well. I’ll be using the D’Addario Recording Basses & the Savarez Carbon trebles on my Ramirez & loving life.